Prime Minister Tuilaepa Dr. Sa’ilele Malielegaoi has offered Samoa’s congratulations to the University of the South Pacific (U.S.P.) for its 50th birthday being celebrated in Samoa this week. The Golden Jubilee brought lots of colour and joyful noise to the streets of Apia on Tuesday morning when former students and present students took part in a celebration parade. The parade featured Cabinet Ministers, Members of Parliament, heads of government bodies, business leaders and people from all walks of life whose lives were influenced by the University in one way or another. The celebrations kicked off on Monday at the University of the South Pacific’s Alafua Campus. A key activity that attracted many students and staff was the elimination rounds of a debate series that took place in the C2 Lecture Room. Debate teams were organised according to their faculties, and the motions centered around ways in which the University has impacted its region in its half a century life-span. Debate 1 was on the motion: U.S.P. Has Lived up to its Ideals in the Last 50 Years, which was supported by Team PacTAFE; and opposed by Team FALE. Team PacTAFE members were Salvadeous Toleafoa, Ruta Phillips and Lili Elder while Team FALE members were Simeanamulu Fiti Laupu’a, Victory Tuala and Leva’ula Titimaea. The winner of this first debate was Team FALE. Debate 2 was on the motion: The USP Qualifications Are Relevant for Meeting U.S.P Nations’ Priorities, which was debated affirmatively by Team F.B.E., and opposed by Team F.S.T.E. Team F.B.E. members were Justin Schmidt, Magnolia Taulealo and Hairani Haini while Team F.S.T.E. were Seira Lio Tofete Carol Tuitoga and Tolofa’i Isaia. The winner of this debate was Team F.S.T.E. The finals were held yesterday. 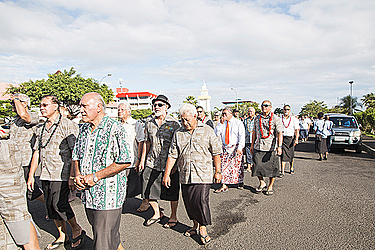 In front of the Government building on Tuesday, Prime Minister Tuilaepa said U.S.P. has played a pivotal role in the development of Samoa and the Pacific region. “Since its inception, U.S.P. has shaped the Pacific region for the better and making itself a source of immense pride for the region, this has transformed its position from just an autonomous university in the region to its status as an excellent cultural education provider, research institution and development organization,” he said. The celebration continues today with the graduation of Members of Parliament who studied a law course at U.S.P. The graduation will be held at the TATTE Building.